Talitha’koum and Rala Khan felt like they’d talked for hours. The Twi’lek showed Rala her heart, and how mastering the Dark Arts was more a tool to be used constructively than a true reflection of herself. And Rala admitted to presuming her darkness was stronger than Tal’s light. “So you wanted to test me?”, Talitha asked. “And myself. I wanted to prove the Overseers and Dark Council were right. That the darkness could, and should, prevail.” Rala struggled to articulate what had been a gut-instinct reaction. Tal managed a tired smile. “Yeah” was all the shattered human Warrior could manage. In reality her mind was racing. She hadn’t accepted her friend for who she was. But Talitha had also not tried to change her friend – “convert her” to the Light. That threw her misconceptions out the window. But in a strange twist of irony, this girl was also now the only person she could trust. That caused complications and a clear conflict of interest. The Twi’lek pulled herself to her feet, wincing from the strained leg muscles and the partially healed wound inflicted by her friend. Reaching into her satchel she pulled out a datapad. The Warrior’s head shot upwards. “But, but…we’re miles away from the landing zone!”, she protested. “Then we improvise. Come on let’s wrap up and get out of this cave. Do you still have your crystals?”, Talitha asked. “Yes, I left my outer garment just inside this cave, knowing I might break them fighting you.”, she replied blushing slightly. Talitha checked her container and was relieved to see that her cyan crystals were still intact. Turning around she quickly extracted a couple of blue and green ones. She hoped one of the Artificers at the Academy could teach her how to craft replacements in case her saber became lost. They both quickly donned their warmer clothing, picking up Rala’s on the way out. Time was now their main enemy. As they exited, their faces were hit with a wall of cold. A snow-storm was brewing, which would only make their trek back to the Imperial shuttle harder. The Twi’lek checked her datapad’s map and oriented herself. “You said we could improvise, Tal?”, Rala pointed out. They both slowly reached for their blades, holding their breath, when a figure jumped down in front of them, just a few feet away. Four other, smaller beings appeared behind the larger one. A familiar snap-hiss warned the two Acolytes. Snow was beginning to fall, flakes fizzling out on the green blade that was now pointed towards them. “You made a big mistake coming to Ilum, Sith”, the Jedi Master threatened. “We are only making the same pilgrimage you are Jedi,”, Talitha explained. “There are just a handful of us. We…we tried to avoid you, not get in your way.”, nervousness creeping into the Twi’lek’s voice. Rala looked between her friend and the Jedi Master, anger stirring inside her. How dare this Jedi, with his weak Padawans get in the way? This delay might cost them their trials! “I know how you’re feeling Rala, please take a breath”, Talitha steadied her friend. The Jedi Master’s eyes flicked from one Acolyte to the other and back again. But his Lightsaber remained ignited. Something didn’t add up here. “You, Twi’lek, what’s your name?”, he demanded. “Hate radiates from your friend, but you…you I don’t understand.”, his brow furrowed. “You don’t need to understand. We came in peace and wanted no confrontation. In fact we were told by our Masters not to confront any Jedi here,” she explained, confidence slowly rising. He stepped back and sheathed his Lightsaber. The Padawans around stood in awe at their Master facing two Sith but not attacking. And on top of that, the two Sith they found had not attacked them either. “Sheath your blade Rala, the Overseers wouldn’t be happy to know we disobeyed them.”, Talitha reasoned. Begrudgingly, Rala had to agree, though she was still struggling to hold her anger inside her. “We came on our own Gathering. Most Acolytes stayed back on Korriban to manufacture their crystals. A small handful of us came to Ilum. We have avoided sacred Jedi sanctuaries, and chosen caves you and your Padawans were not inhabiting. We are in no state to fight, having…injured ourselves. All we need to do is to leave in peace, to reach our shuttle and get medical help.”, Talitha used all her will to maintain eye contact with the Jedi. The Master sighed and let his shoulders drop. He was fed up of this cold and couldn’t wait to get back to base. This encounter was not what he had in mind. He’d hoped to show these students how the Jedi prevail against the Dark Side, but what he faced here was… something that shouldn’t exist. And with that they trudged off into the snow storm. The two Acolytes breathed a sigh of relief. “Sorry I held you back, Rala, but we didn’t stand a chance”, Talitha explained. They headed back in the direction of camp, but the wind was blustering directly into their faces. The Twi’lek was still limping slightly but her focus was on listening for signs of life. The two friends had fallen silent, mostly because the wind was threatening to take their very breath away. After an hour of trudging through the unforgiving conditions, Talitha finally found a rocky outcrop where a small number of plants had managed to grow in the shade. She raised her hand to tell Rala to pause for breath. The plants I needed for Life Binding…I had nearly forgotten those., she realised. Plant-picking with gloves on was not easy and the wind nearly blew her specimens away. Just managing to hold on she reached into her satchel and pulled out some parchments, wrapping the leaves and pettles carefully in them. It was then she thought she heard a whinneying sound. Frowning she tried to pinpoint the source. She beckoned Rala to follow her. The Warrior was really struggling with the trek now, cursing herself for expending so much energy in fighting Talitha. She needed food and she was out of supplies. She had to follow Talitha’s guidance. Finally a shadow of the creature appeared through the snow. Talitha managed a smile – this is what she had hoped for when saying they would “improvise”. She trod very carefully towards the TaunTaun, hoping the sounds she made would be masked by the howling wind. Closing her eyes, she tried to remember a Creature Taming class she’d taken once. Forgetting all of the theory, she reached out trying to calm the beast. As she got closer, the TaunTaun started to get a little nervous, its whinneying becoming more frequent. Talitha got so close to the creature she could almost feel its warm breath. Then a touch of the head, maintaining eye contact, and a stroke of the nose, the TaunTaun sat down. The Twi’lek beckoned to her friend and they both climbed on the creature’s back. Rala allowed herself to smile. Maybe, just maybe there was more than one path to power. Talitha patted the side of the TaunTaun who rose to its feet, and motioning with her hands the direction they needed to go, they rode off at a pace. The rode into camp with less than an hour to spare. En route, Talitha had managed to send a signal to the Imperial Agent who had helped her after they first landed. He was waiting with fresh, warm clothes, food and a stretcher to get Rala to a Kolto tank. The Warrior had passed out from exhaustion and malnutrition on the ride back. Her battle scars had also re-opened, blood slowly seeping through her clothes. “She’s in safe hands Acolyte Talitha, we’ll keep you apprised.”, he snapped to attention then ordered his men to carry the wounded Acolyte away. The Twi’lek wearily disembarked the TaunTaun and rubbed its head. Thank you my friend, she thought. “Imperial Scientists believe once a creature has bonded with a Master, they stay attached.”, the droid responded. 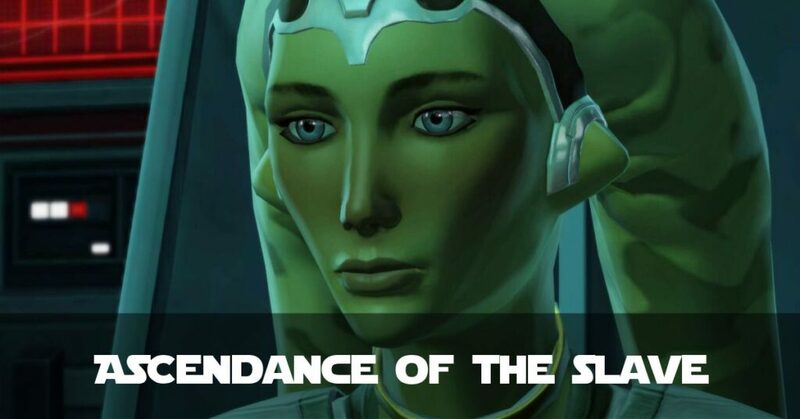 “Won’t he die on Korriban?” The Twi’lek asked, concerned. She led her TaunTaun to the shuttle. Rala had already been taken back to the capital ship, and the acolytes who had survived Ilum had arrived back hours earlier. So she and the TaunTaun had a shuttle to themselves. The end was in sight. The slave would ascend. For now, slumped against her new pet, she just slept. Altoholism – Is it Bad for Your Credit Balance?